All layouts need good lighting. Here I will tell you about how I plan to light up my new layout using LED-strips and controlling the lighting using cheap LED-dimmers with DMX-protocol and free PC-programs to set up the lighting and the sequence to animate night and day lighting on the layout. Its under development, but some of the pieces have been tested. 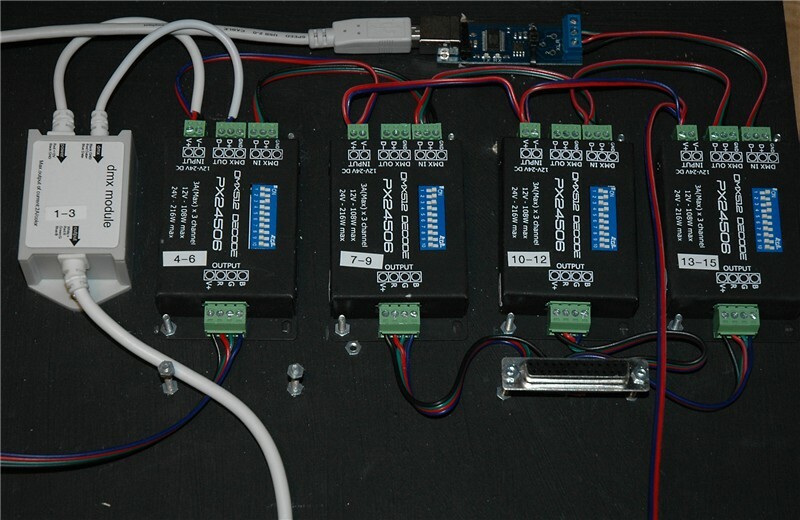 5 LED Controllers for DMX are installed on the layout. 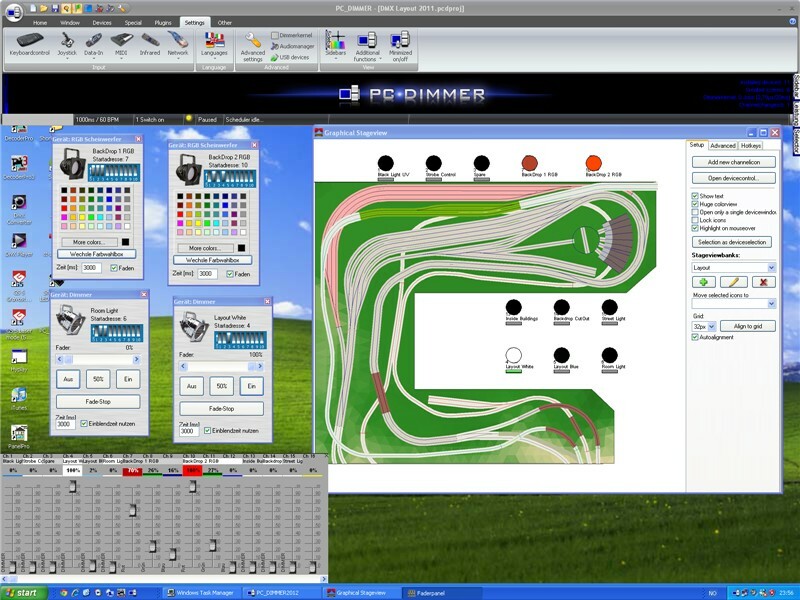 The testing has begun of the software to use, PC-Dimmer. The layout lights(Warm white and blue) and the room lighting are installed. 2 RGB LED strips to be used to create the sunset effect are installed. All controllers have a total of 15 DMX channels, where 9 channels are in use at the moment. 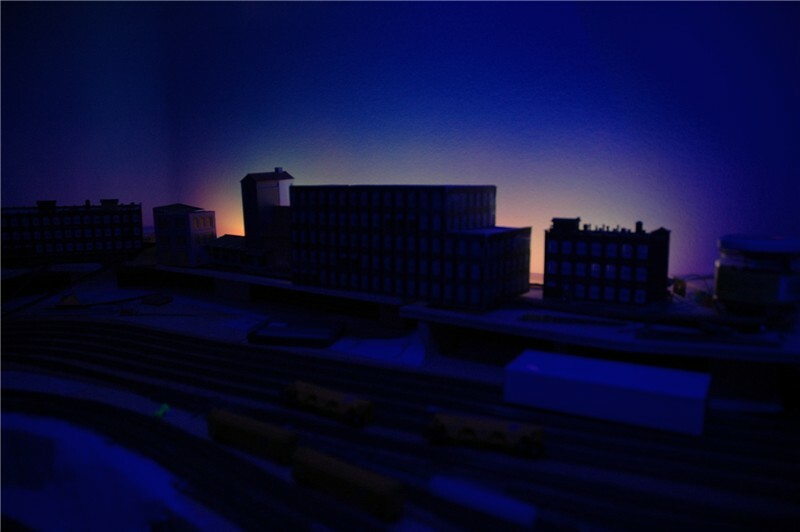 The testing gave some promising results on the layout lighting part. The last days I have done some testing using DMX-equipment to control the lighting and the sound on the layout, with promising result. Earlier I have decided to use LED-strips for the layout lighting, WarmWhite bright LED-strips for the main layout lighting, a Blue LED-strip for the night-"light" and several RGB LED-strips to create the change between day and night + many other effects, like thunder and lighting. And I want to use a PC to control it and sync light and sound. I have done some test with a RGB-driver using PC serial port and my own software, but have now started to look into use product using the DMX-protocol. DMX-equipment is widely used in Theater and show business to control lights, but the price can be a challenge. But, eBay is your friend and when searching for shops in Hong Kong and China, I have found exactly what I need, cheap RGB-controllers. 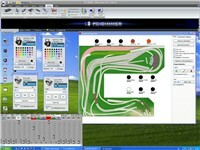 Combined with many free software options, I have started to play with it. Example items on ebay: DXM > RGB LED Controller, PX24506, Type2. DMX > USB interface. I am in the process checking different software, and at the moment the most promising is PC-Dimmer2012, which let me setup different shows, controlling light and sound. Another good solution is DMXControl, but it crash at the moment on my PC. A few other I have tested and work with my USB to DMX interface is the following: StageConsole, Freestyler, AbueLites ++. 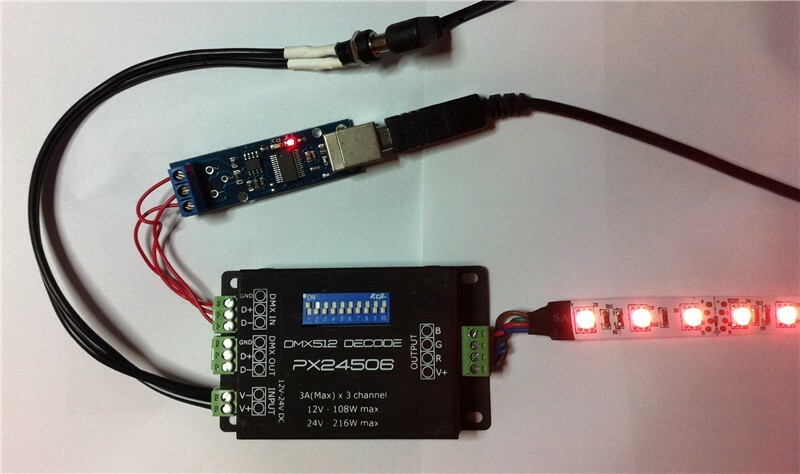 I will also test JMRI to be used with DMX. My testsetup with the USB to DMX interface, a RGB LED-controller and a LED Strip, all controlled by PC-Dimmer.